Scene of the Blog Featuring Sandy of You've GOTTA Read This! 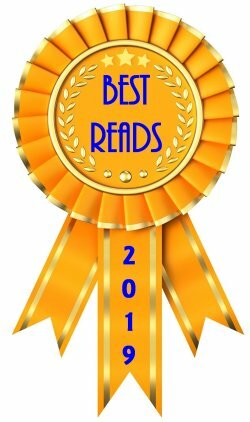 Today's featured blogger has been on my must read list for a long time now. I love her enthusiasm, her book reviews, and now that my husband is hooked on audiobooks, she's going to help me there as well. I even love that cat in her header. Might be a good idea to stop telling you what all I like about her and actually tell you who she is, right? Before I turn over the reins to Sandy, a little reminder: click on any of the photos if you'd like to see them full size. Take it away, Sandy! 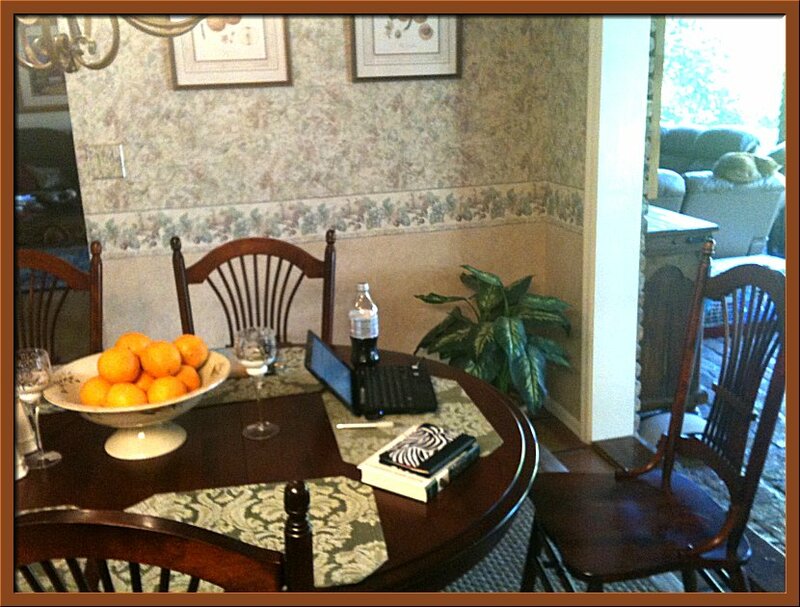 This first picture is where I blog 95% of the time, unfortunately… right at the kitchen table with my netbook. It is nice and bright and cheery, and for some reason the kitchen inspires creativity like no other place in my house. It does tend to be a source of irritation for my husband, because I accumulate books, magazines, my calendar, my Kindle, a Diet Coke or two, and my other blogging needs…a big nest! It is nice and organized in the picture because he recently remarked that I was taking up three seating spaces at the table, and required some immediate action on my part. This second picture is my official desk, which I will occasionally use if the family is home and I need a little bit of peace and quiet. I’m definitely not as inspired in this room, and have been toying with ideas on how to change that. A bright, Mexican rug on the floor? Moving the desk so I see out the window? A project for the new year! This third picture is my wonderful, roomy reading/drinking chair. I curl up there to read often, and my husband and I sit in this room at night and share a glass of wine and stories about our day. Every now and again, I pull my netbook over to this chair and get comfy, usually on the weekends when I am writing my Sunday Salon, or if I am visiting blogs. This chair will only allow a minimum of brain activity it seems. When Sandy told me that she often blogs in her car while waiting to pick her children up from school, I have to admit I said, "We've GOTTA see that!" Sandy obliged! As you can see, I prop my little netbook on one knee and can get caught up on my blogging while I wait! I love it…no dead time at all in my life. What is nice about my netbook is that it has a wireless card in it, that allows Internet access anywhere! It just feeds my addiction. Also, you might see back behind my computer that I am listening to an audiobook as well on my stereo system (Freedom by Jonathan Franzen). It doesn’t get any better than this. There's something about reading and blogging that are conducive to making nests. I have an L-shaped desk that provides me plenty of space for empire-sized nests. In fact, I just cleaned up a couple the other day, and when Denis came home from work he took a look and said, "Wow! Wood!" Big, squashy, comfy chairs like the one you have do not promote brain cell activity. At least not my brain cells! And what can I say about yet another mobile blogger? You have an almost perfect set-up in your car! Thanks so much for letting us have this glimpse into your creative spaces, Sandy. 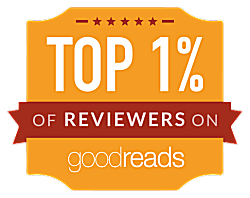 We really appreciate it! Stop by next Wednesday to meet another member of our book blogging community! 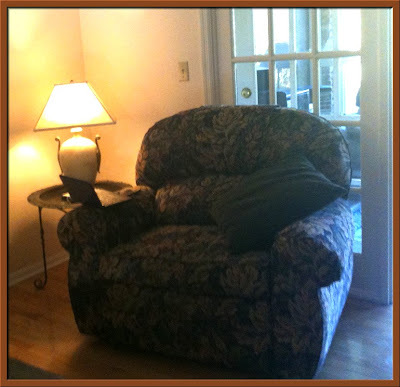 That's great that Sandy shares her blogging and reading space with us. I'm always curious to know where do fellow bloggers read or blog. And Sandy's reading chair looks very inviting! That reading chair looks extremely comfy. You probably can sit in it for hours on end! The desk doesn't look inviting, somehow! That's a nice car set-up Sandy! I think that giant chair would be my #1 spot. Thanks for the feature Cathy! 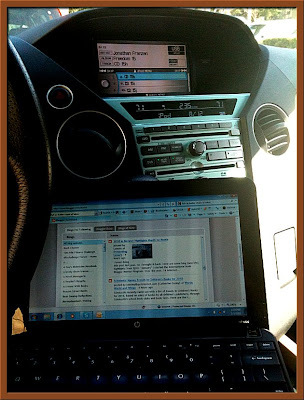 Yes, blogging in the car is the true sign of my need to multi-task. It seems like I never have enough time in the day to do my blogging. I appreciate the help on redecorating my den! All ideas are welcome! I haven't taken to blogging in the car yet, but I do have my mobile phone to read posts on whereever I am. i can see it is only a matter of time before I have a laptop for the car! What a great feature! Sandy is the ultimate multi-tasker. I love all the spaces you have set up for blogging, and it does seem like you have a space everywhere in the house for it. I am impressed that you even work in the car! I also know what you mean about the blogging nest, as I have one too, and my husband is always getting after me about it when he wants to share that space. But c'mon, you can't have a blogging space without a nest, you know what I mean?? Great post, thanks for sharing with us, Sandy! Yipee, we get to see one of my favorite blogger's space! I love the nesting you do. I think we all do that, except I nest everywhere in the apartment it seems. I think the desk area needs more light, a window, and maybe a nice cushy chair...that might help. I'm so glad to see Sandy's space! I've loved her blog for a long time and actually got to meet her in September! You all are too kind! You guys have definitely inspired me to spiff up my den. I'll get to that right after we finish my husband's spiffing of his new media room! Priorities! I love the over stuffed chair! And I'm impressed with blogging in the car! I often read blogs on my phone, but haven't taken to writing posts on the go. I can see why the kitchen table is the preferred blogging space, it's just so cheerful. My home office, where my computer lives, makes me think of work. So I usually end up dragging the notebook to the couch and sitting there instead. And thanks Sandy for letting us see your space. I really enjoy this feature. Your house is so organized! OMG, I love your set up on the road! Thank you for sharing with us Sandy. 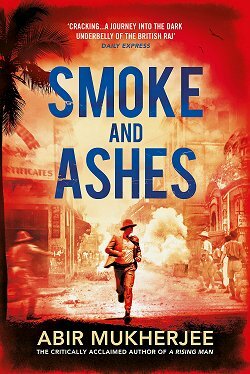 So fun to read. Sandy you can pretty much blog from anywhere! And I though I was cool taking my laptop to Central Park. Ah - so I should refer to my piles of crap surrounding my blogging spot as my nest? Good to know! I blog from a big comfy chair like that most of the time - like right now with a big warm kitty curled up on my lap shedding on my keyboard. Sandy - I am shocked that you have not found a way to employ that software that types as you talk - then you could blog and drive at the same time!!! I loved seeing where you do your blogging Sandy! I blog in my dining room too, but at a computer desk. My books (and the rest of my blogging mess - papers, empty mailers, etc.) sometimes take over the dining room too. That reading chair looks more like a napping chair. I'd never get anything read if I sat in that one!! Haha! 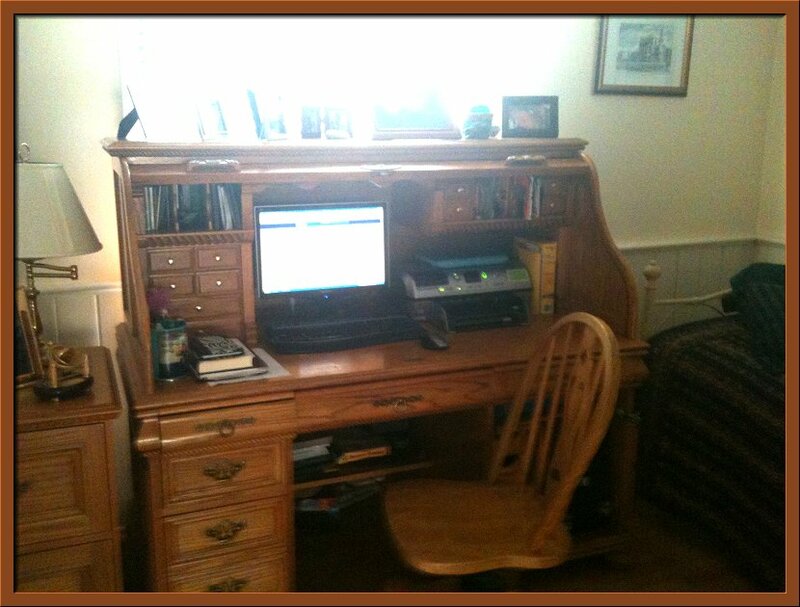 I love to visit the homes of bloggers this way and love to see how they blog and where they do it. I love that desk. I think moving it for a view of the window would be a fab idea. Great blogging space Sandy! It's always awesome to see where people are in their own world. I think moving your desk so you can look out that window would make all the difference! That big comfy chair of yours would only put me to sleep. lol. What a great idea to blog in the car while you wait...but that chair looks way more comfortable. Serena-- I sit and needlepoint and watch HGTV occasionally. The combination of a craft and the shows can spark some great ideas! Molly-- That is most definitely a nest... and leave it to you to come up with the perfect idea of that software! I love all of Sandy's spaces! But the car is great. I'm always about the audiobook when in the car and doing email and twitter on my phone. I don't usually carry my netbook around town. That comfy chair looks perfect for reading a bit, dozing a bit, reading a bit .... ahhhhhhh. The office? Yes, brightening it up and not facing the wall might help. I love the pictures, especially blogging from the car! So crazy and fun. Oh, I'd sit down in that comfy chair and never get up -- let the nest pile up around me (the stack would have to be tall, to reach it from the perch). Sandy! 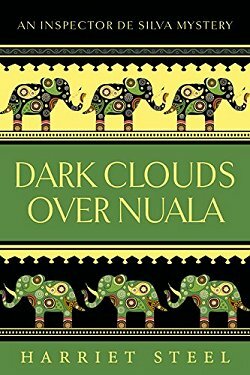 One of my favorite bloggers - her honesty in reviewing is fantastic! She writes them in such a way that I feel as though I'm sitting at the table with her, drinking a cup of coffee, and gabbing about a book. Love it! By the way - loving that comfy chair you read in!